I'm fairly certain that one of the ideas in this book will save the world - I'm just not certain that I'm smart enough to identify or implement it. Kimmerer's writing is deft and lyrical and I found myself reading aloud every other sentence, dog-earring and highlighting the whole way. This will be a well loved and treasured book in my library for the rest of my life. As a botanist, Robin Wall Kimmerer has been trained to ask questions of nature with the tools of science. As a member of the Citizen Potawatomi Nation, she embraces the notion that plants and animals are our oldest teachers. 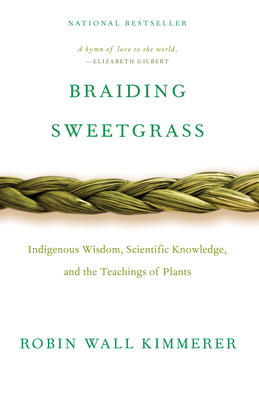 In Braiding Sweetgrass, Kimmerer brings these two lenses of knowledge together to take us on "a journey that is every bit as mythic as it is scientific, as sacred as it is historical, as clever as it is wise" (Elizabeth Gilbert). Drawing on her life as an indigenous scientist, and as a woman, Kimmerer shows how other living beings--asters and goldenrod, strawberries and squash, salamanders, algae, and sweetgrass--offer us gifts and lessons, even if we've forgotten how to hear their voices. In reflections that range from the creation of Turtle Island to the forces that threaten its flourishing today, she circles toward a central argument: that the awakening of ecological consciousness requires the acknowledgment and celebration of our reciprocal relationship with the rest of the living world. For only when we can hear the languages of other beings will we be capable of understanding the generosity of the earth, and learn to give our own gifts in return.